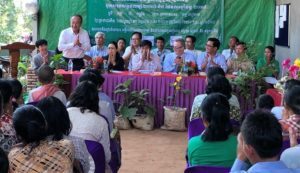 Good cooperation with Japanese bank on micro-credit to Agricultural Cooperatives in Cambodia! The need of credit for the purchase of seed, manure, herd and feed etc. is great in Cambodia, but loans are expensive, and they are difficult to achieve. Micro-credit institutions (MFIs) lend at an interest rate of around 2% per month against collateral in the property (annual cost 27%). However, for the poor, it is difficult to qualify for a loan, because it is difficult to provide loan on collateral basis, and the paperwork is overwhelming. Many therefore have to rely on private lenders in the villages (“Rich Men”), who provide short-term loans at a rate of at least 5% per month (annual cost 80%). The Agricultural Cooperatives (AC), which have been formed in recent years in Siem Reap and Oddar Meanchey, have, however, established good cooperation with the Japanese bank ´Idemitsu Credit Co.´, which has been active in Cambodia in the past two years. The bank has granted a fair credit with an interest rate of 1.1-1.3% per month (annual costs 14 -17%) without any collateral other than the equity of the small ACs. There are acknowledged words from the bank for the ACs´ administration, business planning, budgeting and period reporting, and there is great recognition because the repayment rate among the members is 100%. ´Idemitsu Credit Co.´ is looking forward to the cooperation with the ACs´ new ´joint association´, which has just become a reality with official registration in January 2018. At the same time, the ACs’ ambitions on conditions and loans increase (loans on 350,000 USD in 2018 alone in Siem Reap). The members´ and thus the ACs´ wish for even lower interest rates, thus their applications need a trip over Tokyo to be treated and hopefully approved. Thus, the enthusiasm was great, as the president, Hiroyuki Tamada from ´Idemitsu Credit Co.´, as well as five other senior representatives of the bank, met up to the General Assembly of the ´Kan Traing´- AC on 22.02.2018. There he stated that there is a great satisfaction with the previous cooperation, and further that the bank is responsive and will consider members’ desire for loan amounts and better future loan terms. President Hiroyuki Tamada (standing) and representatives of ‘Idemitsu Credit Co.’ participated in a successful general meeting with approx. 250 participating members, mainly women. The ´Kan Traing´- AC, established in 2014, set up a tent outside the warehouse and administration building. The general meeting was followed by dining by all guests and members – the atmosphere was happy and lively.